Entering the mysterious world of birdfoxmonster, we are encouraged to wash our hands before eating, which we duly do on moist, warm towels handed through an opening in a black wall by unseen persons. Then, all 30 of us gradually file into a darkened space towards a spotlit pumpkin stuck with forks wrapped around with spaghetti and spinach, which we pull out and eat. A soft, rumbling voice, somewhere between the Cookie Monster and (as a fellow audience member observes) Tom Waits, riffs upon the delights of spaghetti smothered in melting butter. We are here for an unorthodox dinner designed by artists from Studio A (a Sydney-based organisation that fosters the professional development of artists living with an intellectual disability) and Erth, the live-theatre company known for creating up-close, exhilarating puppetry encounters for children. Gathered in this dimly lit space, with its promise of anthropomorphic characters, there’s more than a hint of having fallen down the rabbit hole. Entrees eaten, our attention is drawn through a subtle adjustment in lighting to a long, narrow table that bisects the rectilinear room, with projected text on either side directing us to take a place, to sit, to reach for our glasses and raise them in a toast. And so, with a sense of occasion, the performative dinner begins. Black-garbed and masked wait staff issue plates from opposite ends of the table to be passed from person to person until all are served; a nice touch that fosters a communal atmosphere among the participants. But there isn’t much time to talk, as three striking, even somewhat sinister, figures appear at the far ends of the table. 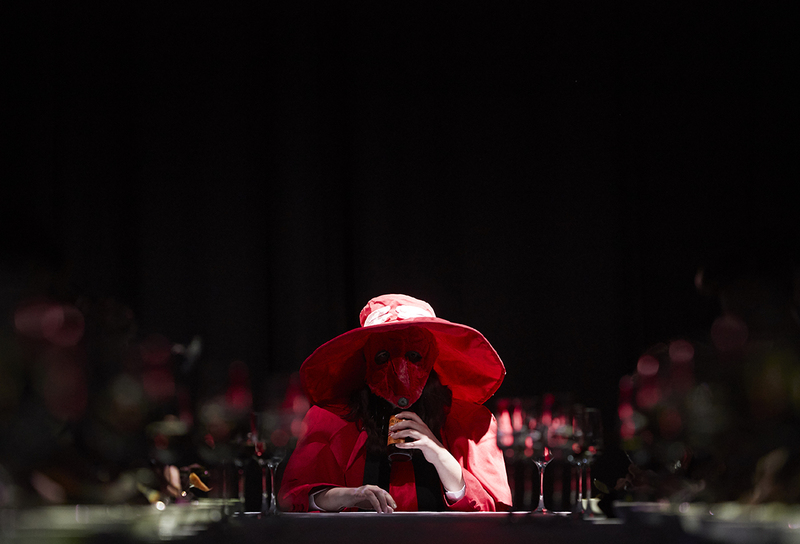 The first I see is red-robed, with a broad-brimmed hat framing a white fox-mask with dark eye holes. 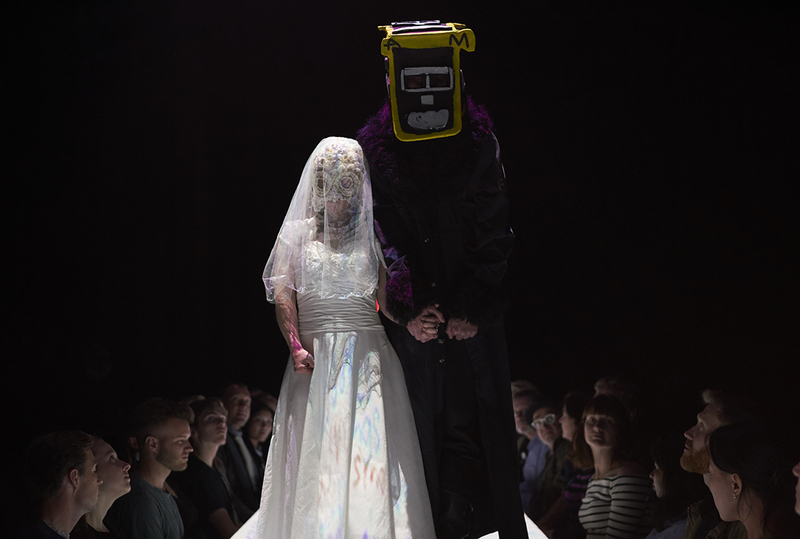 Then I become aware of a bridal figure in a white, sequinned owl mask, and an imposing black-clad monster with a boxy, geometrically patterned head. 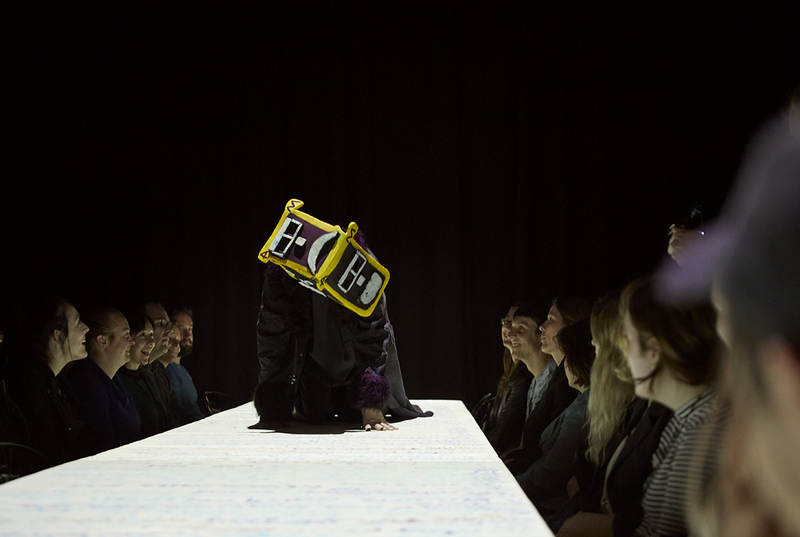 During the three-course meal, the table will by turns function as a canvas for projected animations, a dancefloor and a ceremonial aisle. As we work our way through dishes chosen for their significance to the three performers – fillet mignon for the Owl (Meagan Pelham), seasonal vegetables on seaweed for the Fox (Skye Saxon) and “Thom’s Burgers!”, slapped together at the behest of the Monster (Thom Roberts) – each of us will experience birdfoxmonster differently. There is so much to take in: a wealth of sensual clues with which to decode this immersive work of live art. Early on, the Owl Bride and her Monster fiancé climb onto swings rigged either side of the table and crest languorously back and forth through the darkness, as if to hypnotise us into entering their personal fantasy realm. From this point on, I experience the work as a series of impressions that seem to mix memory, imagination and desire. While we eat, the Bride dances down the length of the table repeatedly stamping, booty-shaking and descending into a graceful back arch, one arm extended. Animated flying hearts dance along the table too, as the music (composed by James Brown) pulses. For a little while, there’s a soundtrack of heavy rain, with a recorded conversation between two performers about the experience of being in the eye of a storm. The Fox circles the diners, howling. The table swims sinuously with digital artist Elias Nohra’s projections of animated fish, owls, romantic text and geometric patterns, all of them derived from the three artists’ drawings. The event climaxes in a wedding, with Fox officiating as the lanky Monster and petite Owl Bride step in stately time-honoured fashion to organ music along the wedding aisle of the table. Ceremony over, the Bride primal-screams hip-hop into a mike in the centre of the table, music pounding: a triumphal, full-bodied response to the solemnity of the occasion. Then, the guests wash the dishes at the same table, inhaling drifts of, alas, a purely olfactory dessert of blueberry pie. Dining here was like entering some shadowy Max Ernstian realm where animal-headed gods conduct strange rituals within a formal setting, or perhaps the world of Australian artist Vali Myers, who decamped to Positano and adopted a large number of stray animals, developing a folkloric narrative of her life through her paintings and personal style. Through their three alter-egos, Pelham, Saxon and Roberts created an idiosyncratic mythology of self that imbued every last detail of the production, from the costumes to the delicately hand-painted crockery, resulting in a wonderfully rounded and transportive experience.